Sometimes I wondered how our neighbour George Korry managed to concentrate on his farm chores when my Mother was baking her sourdough cinnamon rolls. If the wind was just right, I could smell them as soon as I stepped off of the school bus on the Third Line. Even for the thirty seconds that it took to open the door, just long enough for me to exit the bus; I imagined that the sweet scent of cinnamon snuck its way on, and whetted the appetites of my friends from Glen Tay School. I’m not sure why the sweet smells of Mother’s baking seemed more intense in the cool, fall air, but I followed the aroma up our laneway, through the yard, and into the kitchen. The kitchen was always warm and bright. Maybe it was the cheerful wallpaper with the yellow accents depicting images of copper cooking pots and kettles. The oven light was on, as it often was, and there was a batch of cinnamon rolls on the middle rack turning a beautiful shade of golden brown. One batch of cinnamon rolls was already cooling on the metal rack on top of the freezer. Beside it, was another rack with two loaves of bread, the long bread knife, and a small shallow dish of fresh butter keeping it company. Decisions, decisions – which would I have for my after school snack? The cinnamon rolls smelled delightful, but the fresh, warm bread and butter were giving the rolls some stiff competition. I was almost too busy to notice that Mother was mixing some icing sugar, with a little dab of soft butter, a dash of vanilla, a splash of warm water, and was mixing up a very thin, very lustrous icing. 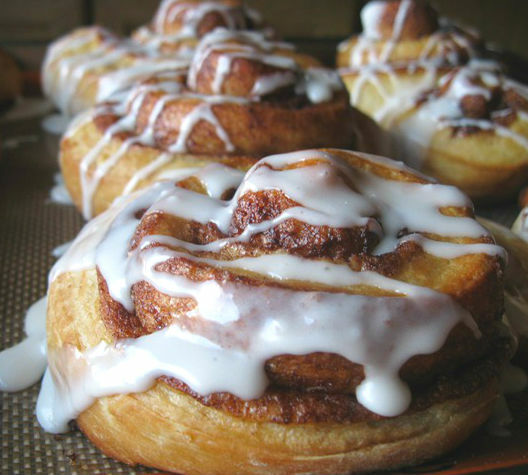 She took a tablespoon, scooped a bit from the bowl, and drizzled it over the cinnamon rolls. The silky, white icing slid lazily down the sides of the warm rolls, and pooled at the bottom of the old china plate. “Would you like to try one?” she asked. Well, no one had to ask me twice! I turned around to the sideboard, grabbed one of the small melamine plates, and a fork from the cutlery drawer, and I eased one of the soft, fragrant rolls onto the surface. “Don’t spoil your supper!” Mother warned, like she always did, smiling at the same time, glad to see that I was admiring her handiwork before plunging the fork into the roll. I scooped up a bit and put it in my mouth. The roll was warm, and the aroma of the cinnamon was stronger now, and tasted even more intense than it smelled. The mixture of the brown sugar and butter in the creases of the roll, still heated from the oven, and the vanilla icing melted together in a rich, doughy taste sensation. Looking back, I realize now that this was the thing that made the hardships of the long school day fade away. It was the thing that made the long, dark days, and the cold weather easier to tolerate. It wasn’t just the smells and tastes of the baking, but the bright, warm kitchen. It was not so much something that you thought about, but it was something that you could feel. It was having someone glad that you were home from school, and making something with love, for all to share. The sights and sounds and smells from our Mother’s kitchen are something we carry with us every day. They lift our spirits in times when life seems cold, and harsh, and unforgiving. We need only to close our eyes and we are back on the Third Line, walking up the lane, through the yard, and entering the bright, warm kitchen. We are home again. This entry was posted in Short Stories and tagged Arlene Stafford-Wilson, baking, lanark county, recipes.